For the first time ever, the EU Commission has mapped out how much public money flows to the energy sector in Europe and where it goes. According to a new report prepared by consultancy Ecofys, Europe spent €113 billion on energy subsidies in 2012. Remarkably, public support for coal is equal to that of onshore wind and total support for renewables is not much higher than for non-renewables. Also remarkably, the estimated “levelised costs” for solar are comparable to those for nuclear and gas-fired power, and lower for onshore wind and geothermal. The European Commission chose to launch its new energy subsidies report as discreetly as possible. It was simply put online, unannounced and without a press conference, on Monday afternoon 13 October. Moreover, at the same time, the Commission put online a new progress report on completing the EU internal energy market – with no less than six Annexes. The subsidies report comes with five annexes of its own by the way. This makes life difficult for journalists. Here at Energy Post, we will return to the internal market report – which will tell us why we are not going to complete the internal market by December as we’re supposed to do – and focus first on subsidies. How much is Europe spending? A lot, in a nutshell. The challenge is to say exactly how much. This is a numbers-heavy report: every stat can be countered with another stat, every assumption challenged. There are absolute costs and costs per unit of energy produced, external costs and historical support (but still with an influence today). There is no universal definition of a “subsidy”. There is data missing – nothing on member state loans for new nuclear power plants for example – and data that has changed since 2012 – think renewables subsidies. The consultants have centred their work on 2012; “recent” means 2008-12 and “historical”, before 2008. Transport is excluded and with it, most of the oil industry. Nevertheless, this is a historic attempt to identify how much public money goes to the energy sector and it has succeeded insofar as its estimates fall broadly in line with those of earlier, albeit less ambitious, studies by for example the OECD, say the authors. The list of caveats is long and the uncertainty reaches a new high when it comes to estimating external costs – by definition free of a market value – but the consultants have come up with some figures. The first is €99 billion – the amount of public money spent on energy in Europe in the year 2012. Add to this €14 billion in free carbon allowances and you get to €113 billion. Add to this another €9 billion in historical support – support instigated before 2008 but still having an effect in 2012 – and you get to €122 billion. This, says Ecofys, is by how much the energy sector benefited from public support in 2012. The sum is the result of over 700 public interventions in the energy market. Most of the money was spent in Germany – some €25 billion – followed by the UK (€13 billion), Italy and Spain. EU-level support came in at about €12 billion – mainly via regional development funds, the European economic recovery programme and R&D support. In line with most of the money being spent in Germany, it was most often dispensed in the form of feed-in tariffs (€26 billion), followed by investment grants (€13 billion). Consumers paid €40 billion of it all directly through levies on their energy bills. Over two-thirds of the spend went to energy production and nearly a third to driving (not reducing!) demand, usually through tax exemptions on consumption or as price guarantees. This demand part benefits different fuels in proportion to their place in the energy mix i.e. in this case primarily gas, coal, nuclear and oil. Energy efficiency – supposedly a first priority for European policymakers – got just €9 billion in 2012, or less than 10% of all that was spent. The biggest recipient of public funds in 2012 was renewables, with €41 billion going mainly to solar (€15 billion), wind (€11 billion, 10 billion of that for onshore), biomass (€8 billion) and hydropower (€5 billion). Conventional fuels didn’t do too badly either, with coal leading the pack with €10 billion, followed by nuclear (€7 billion, primarily for decommissioning and waste disposal) and gas (€5 billion). Note that coal therefore received as much public money as onshore wind in 2012. These figures are all for production support. If tax support for energy consumption and free carbon allowances are added on, they “would reduce the gap between support for renewables and other power generation technologies” the Commission said on Monday. Ecofys also noted that 2012 was probably when support for solar peaked. Grids got just €200 million in 2012 by the way – perhaps one reason why the internal energy market is so far from complete? Historical subsidies are substantial above all for coal and nuclear, prioritised in past eras for their perceived role in energy security. They remain difficult to calculate – the Commission says further work is needed – but Ecofys has made an attempt. Coal subsidies for example come to €10 billion not just in 2012, but as an average annual figure for the period 1970 to 2007. Most of that is in Germany. In total, direct historical support (i.e. direct subsidies instigated before 2008 but still having an impact in 2012) for coal, nuclear and hydro amounted to €3-15 billion in 2012, with nearly four-fifths of that going to nuclear. Nuclear captured a similar share of past R&D support, most of it going to fission, with fossil fuels and renewables roughly splitting the remainder. What are the external costs of this energy mix? If consumers past and present ultimately have to pay the €122 billion in public support for energy in 2012, consumers present and future will pay for the €150-310 billion in external costs estimated to accompany their energy mix. These are costs to society not captured by the market. They encapsulate the life cycle impacts of each energy source, from the environmental and transport costs of extraction to nuclear accidents. The biggest cost is for climate change, accounting for about half of the total, followed by depletion of energy resources (the increased marginal cost to society of the consumption of finite fossil or nuclear resources now, rather than in future) and traditional air pollution such as particulate matter. Unsurprisingly, fossil fuels do worst in terms of total external costs, followed by nuclear and finally renewables (especially biomass and solar). There are all kinds of uncertainties and caveats around these figures – and interesting explanations too. For example, why does hard coal come out worse than lignite? This is because lignite use in Europe is dominated by Germany, which has high standards of emission control. Hard coal use is more mixed across member states, with higher average emissions. 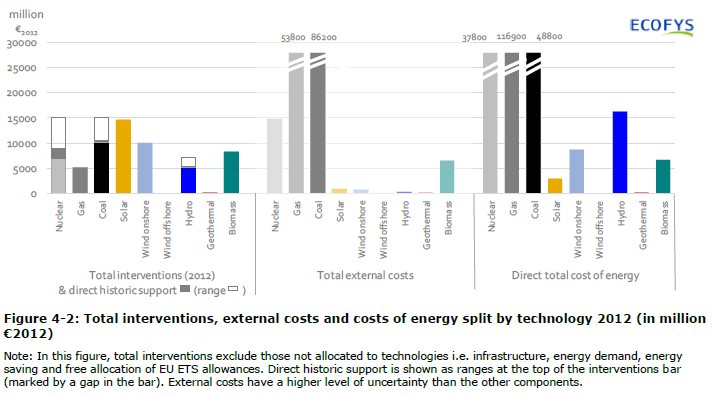 External costs differ per country and technology, a function of their proportion of fossil fuels and total energy production. For climate change, the consultants assumed that the damage from CO2 emissions is worth a lot more than the EU carbon price today. Using existing literature, they settled on a cost of €50 per tonne of CO2-equivalent. Minus the current carbon price of around €7 a tonne, this equates to an external cost for climate change of €43 a tonne. They also took into account national carbon taxes where those exist. Electricity system costs induced by renewables were considered negligible. Without intervention, how much would it cost? To give context to the magnitude of public support, the consultants calculated the hypothetical costs of energy production without public intervention, had the capacity been installed in 2008-12 (so-called “levelised costs”. There are four components to these costs: upfront spend (capex), operational costs (opex), fuel costs and potential revenues from by-product sales. For offshore wind, costs with and without offshore grid costs were calculated. For photovoltaic power, the consultants used data for 2012 (rather than 2008-12) because costs had come down by 60% versus 2008! For the heating sector, Ecofys also took account of five climactic zones. If you look at the levelised cost per MWh of energy produced (these exclude “system” costs, e.g. grid investments), what’s most interesting is solar is only just over €100/MWh, the cost of nuclear and gas. Onshore wind is already well below that, at just over €75/MWh and coal is only slightly cheaper. Geothermal is cheapest of all (€60/MWh) and hydropower most expensive (€140/MWh), followed by biomass (€130/MWh) and offshore wind (€125/MWh). If you add on external costs, gas and especially coal are disadvantaged. Solar power is improving its competitiveness at a rate that conventional technologies will never be able to achieve, said the European Photovoltaic Industry Association (EPIA) on Monday. This report is full of big numbers with big uncertainties and stakeholders are invited to comment in what are after all being billed as interim findings. To give some perspective on the level of support: the €100 billion being spent on energy subsidies and €150-300 billion in external costs add up to more than half of the wholesale cost of our energy, which is about €500 billion. Next up: retail prices. Explicitly left alone by this report, the Commission nonetheless notes: “Retail prices are not determined by the levelised costs of new technologies, but rather by the whole energy system and its legacy.” And as we’ve seen, what a legacy it is. We anxiously await the Commission’s new policy paper on the retail market to see how consumers might be freed from this legacy and how the internal market might finally deliver for them. Great summary. The report does seem to find that ‘Electricity system costs induced by renewables (are) negligible’. Is this worth to explore more in detail, as potentially billions of Euro’s of public funds are lined up across Europe in Capacity Remuneration and Security of Supply for power schemes in order to induce and/or keep gas power plants to be online? Whereas mothballing and non-investment in renewable back-up generation seems to be triggered by renewables. Curious for other readers views?